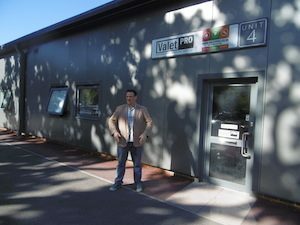 Gregory Spink shows us how products are made at accessory brand Valet Pro. It’s a bright and fresh day in Sussex Weald – except for the farmyard-come-industrial estate that we are visiting today where ‘rotten’ might be the best adjective to describe the air. The stench… “That would be the Dragon’s Breath” says Gregory Spink, referring to a wheel cleaner currently being produced in one of the units just upwind of where we are. “It makes a big impact, but it smells awful, hence the name”. In a world where even a strong toilet bleach smells like a spring meadow, it is a bold marketing decision to not only put an evil-smelling consumer product on the shelves, but to refer to it in the name as well. Neither is the packaging anything to particularly write home about. However, it does spell out the difference between Valet Pro and other auto chemical producers. The team at the company describe themselves as car detailers, and products are designed for efficacy rather than packaging, a point that is driven home to us as Spink explains in detail the PH neutral properties of the wheel cleaner, and how the ingredients change the state between the of the contaminant so that it becomes water soluble. Accordingly, Valet Pro is available through independent retailers where Spink believes that the best advice can be given: “If you get a product in the supermarket, you are not going to ask the guy stacking shelves if a wheel cleaner is suitable for your type of allalloys? Of if a polish is too abrasive?” he said. “Whereas an independent is more likely to take the time to find the right product. We often get calls from retailers, as well as from Joe Public, asking about things such as removing tree sap, and different types of sap and so on”. In fact, Spink finds the way the retail aftermarket is structured as being very complicated. “I find the marketplace just bizarre because you have businesses. like manufacturers that retail and distribute product, plus you’ve got retailers that want to be distributors and you’ve got distributors that have retail” he said, adding that no-one really knows their place anymore. “I don’t mean that rudely, but retailers get upset when brand owners sell their product to the general public and the brand owners get upset when retailers don’t push their product enough” he qualified. “Distributors get upset because they get cut out of the deal because manufacturers go direct to retailers”. There’s one loser in this situation, according to Spink. “It rules out the independent retail shops who are getting frustrated that work really hard with other brand owners, only to find that they haven’t got the market that they used to have”. To counter this, a lot of Valet Pro’s retail customers have styled themselves as ‘boutiques’ for detailing cars. We see some pictures of accessory shops where the firm’s wares are displayed as if they were rare and exotic ointments. One thing that might surprise about Valet Pro is the amount that is produced in-house. Apart from the afore mentioned Dragons breath, all sorts of other products are prepared in the facility, including pre-wash, bug remover and (by our count) three different types of snow foam shampoo. It would be unfair to describe the production lines as being small, but they are not like the huge automated production lines of some of the biggest players in the market. However, all of the products are mixed with precision and Spink is willing to invest in more automation as demand rises. It isn’t just the products that are made in-house either. The team are proud of the fact that all of the marketing material, right down to the labels on the bottles is also designed in-house. It’s this can-do attitude that has made the company such a must-have among enthusiasts, which is backed up by work with various car forums and websites such as PistonHeads. We are sure that it won’t be long until many more independent retailers will want to stock more specialised ‘boutique’ products. Just try not to breathe in the Dragon’s breath.